Type /macro into the chat area or hit the ESC key, bring up that menu, and hit the macro button. You’ll see a box like the one below, but without all the pre-made macros. Hit “New” (at the bottom) and a side window will pop out. Click the ‘?’ icon, enter the name of the macro (I entered ‘kill’) and hit OK. The smaller window will go away and you can enter your macro text into the ‘Enter Macro Commands” area (see example of the text below.) Notice that my Kill macro shows at the lower left. Once you’re done creating your new macro, hit Save and you’ll see the question mark change into a new icon. Here’s an example which I grabbed from one of my macros. #showtooltip makes sure that Ambush shows when I hover over the macro icon with the mouse pointer. The /cast lines are casting various abilities or directives. You can use spells, buffs, abilities, any number of things. The /use line is for items like trinkets, the example shown is a PvP trinket that adds a bunch of Agility when used, which lasts 20 seconds. This trinket is entered after Ambush because it breaks stealth. Drag the icon for this macro onto your action bar, where it will look like the regular Ambush macro. When you use that button it will cast premeditation (for a quick two combo points) pick the target’s pockets (ewww… soiled linens…) and then whack him upside the backside. After that it will activate the PVP trinket. If you’re hunting for particular mobs enter their name where it says NameOfTarget (using just the first few letters of the name will work fine.) The macro will try to target that mob and then put a skull (raid marker) on it. You can also click or tab to a target, hit the macro, and the skull will appear. This is great for dungeons and marking targets. ‘8’ determines that the marker is a skull, different numbers will create different icons. /yell Kill the guy with the fraggin’ skull!!! So instead of multiples clicking and pointing at herbs you just hit this macro over and over and it mills them right up. It’ll will look for herbs in the order listed and if it doesn’t find any it will move to the next herb. One kink is that if it finds a stack of 1 through 4 herbs it will get confused and stop. All your heb stacks have to be in multiples of five for this to work. You’ll see macros posted here and there on other sites and we have a few in the various guides on this site. Just copy and paste them, play with them, feel free to tweak a bit, and you’ll eventually find yourself becoming more effective. This video will run through much the same stuff, add some details, and run through some Hunter specific macros. You should be able to get some good stuff out of this one regardless of what you do, for example, if you always a pair of spells or cast a series of buffs. 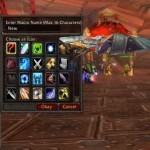 WoWpedia has a list of all of the different macro commands. They also have a macro guide that covers some basics. It’s somewhat out of date, but the concepts and basics are good, it’s just a few details that might be off. 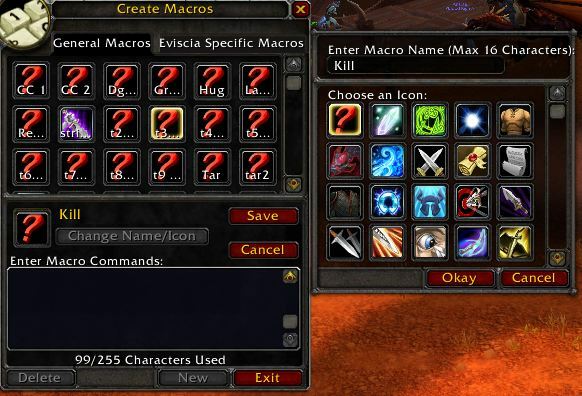 They also have a page that’s an index to all of their macro pages, including pages with class specific macros. Some of these will be out of date (or way out of date,) but you should be able to get some useful stuff. This helps but when I make a cast sequence for my warlock (Yes, I have a warlock) that uses immolate then confagrate and then this curse that I don’t remember from the top of my head. This combo literally makes you slower then that annoying old lady that takes half of an hour to cross a 10 foot long street. The problem is that it only casts immolate… sooooo can you guys add on to that? Generally, you can’t easy add mutiple attacks into one macro, BUT there is a way around it. I just found and added a video that I think answers your questions. Let me know what you think.